Ever heard of a sharpshooter insect? 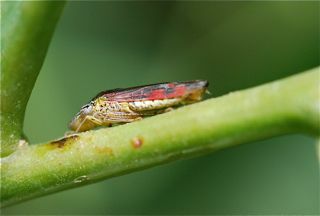 Sharpshooter is the common name of a group of large leafhoppers. 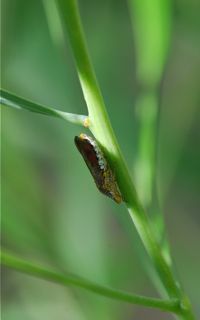 They are elongate, shaped like a torpedo, and feed on plants by sucking the juices. Sharpshooters may have gotten their name from the fact these insects slip to the underside of a twig whenever someone approaches, in order to hide. They have relatively large eyes, and in the past I have had no luck getting one to sit still long enough for a photograph. I would spot one, and then -shuffle, shuffle- it was on the far side of the twig. 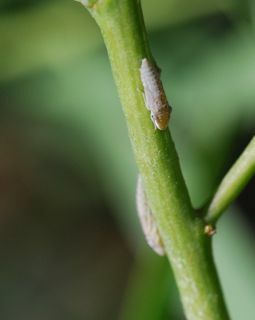 These are adults and nymphs of the smoke tree sharpshooter, Homalodisca lacerta. 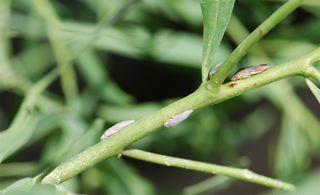 The nymphs are beige and lack wings. The adults have bright red splotches on their wings and wild wavy patterns on their head. And as for shooting, these insects eject a stream of honeydew while they are feeding. If there are quite a few in a tree, it actually can look like a fine mist of rain on a sunny day. These are both males. The females create prominent white spots on the sides of their wings. No one knows for sure why they do this.